Dropping from a size 16 to a size 12 won't happen overnight, but it's a doable goal. With the right diet and changes in your exercise program, it is possible to drop those two sizes. Exactly how many pounds it will take will vary based on the amount of fat and muscle you have, and where the fat is located on your body. It isn't possible to spot reduce specific trouble areas, such as the hips and the abdominal area, however. While sizing differs among brands, a women's size 16 in the United States generally fits a woman who has a bust measurement of around 41 inches, a waist measuring 32.5 inches and a hip measurement of 43 inches. For a woman to go down two sizes to wear a size 12, she would need to lose about three inches from each of these areas. 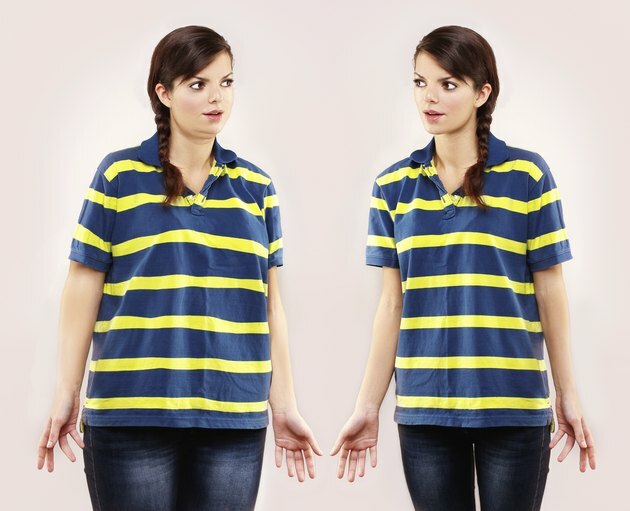 This can mean quite a bit of weight loss, and some women may lose weight more quickly from one area than from another area -- potentially delaying the time it will take for them to drop sizes -- which could make it necessary for them to lose more weight than average. The average amount of weight it takes to move from one dress size to another is about 10 to 15 pounds. Moving from a size 16 to a size 12 means dropping two sizes, so you would need to lose 20 to 30 pounds. Each pound of weight loss requires you to create a deficit of 3,500 calories, so losing weight at a healthy rate of 1 to 2 pounds per week means cutting 500 to 1,000 calories from your diet each day or increasing your exercise to burn the calories that you don't cut from your diet. As a result, it could take anywhere from 10 to 30 weeks to reach your goal of dropping from a size 16 to a size 12, depending on how many pounds it takes to lose 3 inches and whether you aim for a 1- or 2-pounds-per-week weight loss schedule. Women need to eat at least 1,200 calories per day, however, or their metabolism may slow down and interfere with weight loss, so don't cut too many calories from your diet. A pound of muscle takes up less space than a pound of fat, so if you improve your body composition and have more muscle and less fat, you may be able to drop a size without losing as much weight as is typically necessary. Protein is important for building muscle and for losing weight. A review article published in The American Journal of Clinical Nutrition notes that getting between 25 and 30 grams of protein in each meal seems to be the most effective for helping you feel full and lose weight. Eating a diet higher in protein and lower in carbohydrates combined with resistance training and cardio, results in more weight loss and fat loss than a diet low in protein and high in carbohydrates, along with the same exercise, according to a study published in The Journal of Nutrition in 2005. On the other hand, not getting enough protein during weight loss can mean that you lose more muscle than normal, according to a study published in the Journal of the American Dietetic Association in 2008. The more muscle you have, the faster your metabolism will be, because muscle burns more calories than fat, even at rest. If you don't do any resistance training while you lose weight, however, about 25 percent of any weight you lose will come from muscle instead of fat. Women should aim for about 300 minutes per week of moderate intensity exercise and about two resistance training workouts per week, if they're trying to lose weight. The more you exercise and the higher the intensity level of your exercise, the more quickly you'll lose weight and the greater the improvements in body composition are likely to be, according to a study published in Archives of Internal Medicine in 2004. Those who have trouble losing weight from their abdomen should try to increase the amount of time they spend exercising, as a study published in 2003 in Medicine and Science in Sports and Exercise found that weight lost due to exercise is more likely to come from the abdomen than weight lost via dieting alone. Taking a few relatively simple steps could help make it easier for you to cut calories and drop a couple of dress sizes. These include limiting added sugar, fat and highly processed foods, and focusing instead of whole foods such as vegetables, fruits, protein-rich foods and whole grains. Eating the vegetables or soup first at mealtime can help you fill up on lower calorie foods so you eat less of the higher calorie, starchy foods on your plate. Trade your usual sweet dessert for fresh fruit, or at least swap half of your dessert for fruit. Why Did My Weight Go Down but Body Fat Went Higher?